This Guitar is available with a Steinberger Trans Trem or a Floyd Rose Speedloader. This Guitar was commissioned by Chris Burke. This guitar represents some new and innovative things that we are doing on our headless guitar line. This beautiful instrument was hand built entirely in our custom shop. 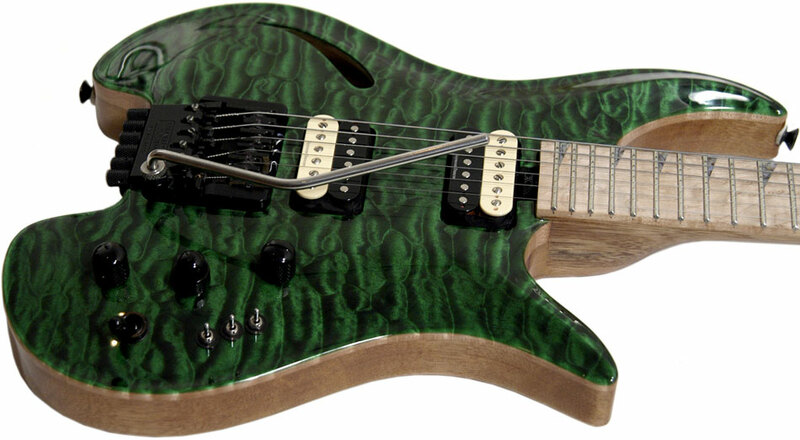 It has a very resonant Korina Body, Purple Heart Stringers and a gorgeous emerald green Quilted Maple Top. This guitar took us longer to build than normal. We had to overcome a number of engineering obstacles. This Guitar switches from Midi to Piezo and it also can blend in the normal electric guitar sound. 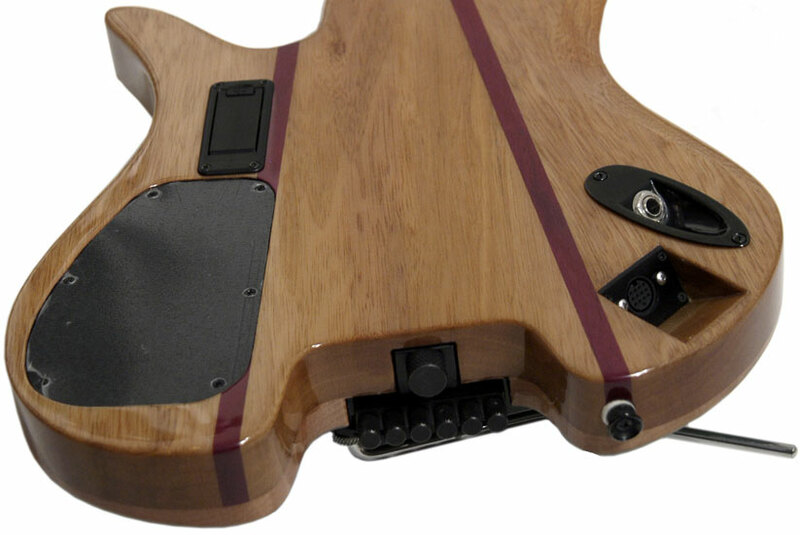 This guitar is the first headless Guitar to be built using a neck through the body construction. This Guitar is the first hollow body Bolero and also the first hollow body headless guitar we have ever built. This guitar is the first Steinberger Trans Trem bridge to have a full piezo system and MIDI saddles installed. We are quite thrilled at how well this guitar tracked. It actually came out better than we had expected. Observe the neatly designed recessed Midi Din Plug port mounted next to the normal output jack. This was the first guitar ever to have Piezo Electric Saddles built into a Steinberger Trans Trem.